Dinosaur National Monument would be our last planned sightseeing stop for our annual migration to Yellowstone National Park. With only three driving days remaining until we got to Gardiner, Montana and a week of relative relaxation before starting our seventh season as volunteer campground hosts at Indian Creek Campground, we were starting to get a little antsy. In Spring 2017 Finally Ends I will share a little of our drive north as well as some images of those first few weeks in Yellowstone before summer officially starts. As an enticement to read on, this article promises to be a good bit shorter than either of the last two. However, I hope the images will prove worthy of your sharing this with your friends and family. We stayed in a relatively new RV park outside Vernal, Utah while we toured Dinosaur National Monument. In my last post, I dedicated a lot of space to our visit to the Quarry Exhibition. I failed to mention the drive we took on the Colorado side of the monument. I think we stopped at every overlook along the road as is our habit. The views were not as great as they could have been because of the weather conditions the day of our drive. However, as we were driving toward the entrance we came upon what at first appeared to be road-kill in the middle of the road. As we approached I could see movement, so I stopped once we were alongside and then realized there was a pair of very young weasels wrestling one another on the road. I backed up, so I might be able to snap a few photos as Connie got out of the car for a closer look. These little guys seemed fearless, but they were in great danger as there was another vehicle approaching from the other direction. I put on my emergency flashers while Connie shielded the critters. Once the car passed, Connie began herding the weasels off the road. At one point both decided they had just about enough of Connie’s encouragement and rose up on their back legs (reaching a height of little more than four inches) and with all their might they hissed at her and showed an impressive arrangement of razor-sharp teeth. Finally, they moved beyond the edge of the road, because they had, in fact, shown that giant who was boss. I was too stunned by this event which lasted only seconds to be able to get any photos. Neither Connie nor I will ever lose the mental images we made. 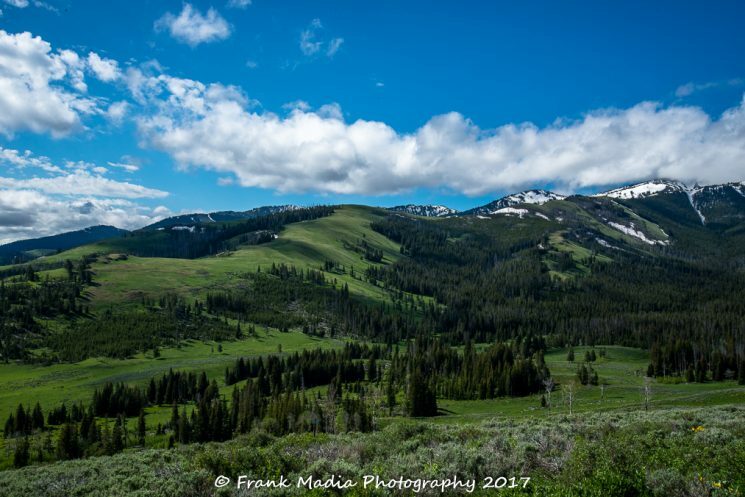 As we were planning our route early in the spring we realized that with a stop in eastern Utah we were dictating a drive up the west edge of Wyoming passing through Alpine on the way to Yellowstone. For those you who follow my wanderings, you know that food has a special place in my memory. Alpine, Wyoming is home to one of the most interesting restaurants I have ever written about in the eleven years I have been writing this blog. Knowing we would have to pass through Alpine, I made it a priority to time our arrival so we could eat at Old Yellowstone Garage, an Italian restaurant that occupies a former gas station and garage. The food is absolutely delightful and authentic Italian. Our original plan had us in Alpine on Memorial Day, May 29. However, while trying to make reservations at Old Yellowstone Garage, we learned they would be closed Memorial Day. However, on Sundays, the restaurant features a set menu put together by the chef that features a six-course dinner. This really sounded interesting, but there was a hitch. Our plan had us spending two nights in Kemmerer, Wyoming so we could visit Fossil Butte National Monument. This relative newcomer to the Park Service managed sites, established in 1972, was to be another opportunity to experience deep history. However, I could smell the food yet to be cooked in Alpine, so a shift in plans was in order. We will return to Kemmerer and a visit to Fossil Butte in the future. However, our main reason for being here was to eat at Old Yellowstone Garage. We were not disappointed with the chef’s choices for the evening’s menu. As important to us as the menu, was the portion sizes. One of the difficult parts of eating on the road all the time is the fact that, generally, portions are so huge that we either overeat or end up with a refrigerator full of leftovers that may or may not ever get eaten. The Sunday menu at the Old Garage has portions that are perfect for getting a taste of the chef’s talents while not over filling. Since there were six courses, that was important. The Antipasto course was Shemeji Mushrooms, Tomato Roasted Eggplant and Ricotta Salata. The brilliant mixture of tastes and textures made us curious about what was to come. The Insalata course was a Wild Arugula salad with Feta cheese, lemon oil, candied pistachios with Amarena cherry Vinaigrette. It too was amazing, and the vinaigrette was just wonderful. The Primo course was Croxetti Pasta, Zucchini, Heart of Palm, White Asparagus, Fresh Tomato and White wine sauce. This course requires a little more explanation. Croxetti or Corzetti Pasta are embossed coin-sized pasta discs that date back to the medieval times in Italy. I had never heard of this pasta, much less had an opportunity to eat it before this evening. I had to look it up on my phone while we enjoyed a beer as we studied the menu. Knowing that the restaurant prides itself on locally sourcing all its offerings, I was surprised to learn that no pasta company in the United States makes Corzetti. Our server set me straight by explaining that the chef makes his own from locally sourced ingredients. I was impressed, then when the Corzetti was served my impressive meter pegged. The mix of vegetables and the pasta with the different textures, flavors, and aromas made for a busy set of senses and smiling faces all around the restaurant. Intermezzo course was Blueberry Sorbet. Not much to say about the sorbet, except that the blueberries were wild and oh, so fresh. Secondo course was Veal roll, Culatello, green asparagus and Marsala Sauce. The veal was wrapped around the Culatello (ham) and asparagus. It had been lightly browned and then roasted to perfection before lightly covered with the marsala sauce. While this was not Connie’s favorite course, for me it was tied for first place with the Croxetti. At the end of this course, I could not have been more satisfied with our decision to bag the fossils for this year. Dolce was S’more’s Ice Cream Sundae. Need I say more. I am not a restaurant reviewer. I can only comment on what makes my taste buds happy, and this wonderful little restaurant has done just that on all three of our visits. I spent a good bit of time during the summer trying to figure a “day” trip to Alpine just to return to Old Yellowstone Garage. We had an early reservation for dinner, so we were able to get a good bit of rest that evening preparing us for what we thought would be a bit of a tedious drive the following day, with the hardest parts coming in the afternoon. We got an early start on Memorial Day and made it into and through Jackson without any traffic concerns. While we were certain that the traffic through Grand Teton National Park would not be horrific this early in the season, we were aware that there could be multiple photo opportunities that could play heck with our timing. 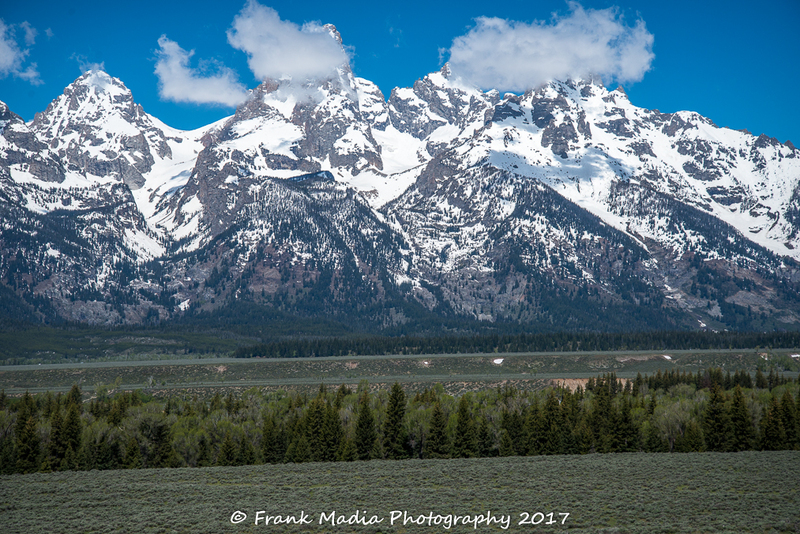 The day was beautiful with a brilliant blue sky that contrasted the granite of the Tetons with the snow highlighting their ruggedness. As we approached from the south I was hopeful that we could make some great images when we got to some of the more popular overlooks. While not completely disappointed, I was a bit less than overjoyed to see some early morning low clouds passing right in front of the peak of Grand Teton. We did stop, and we did make several photographs, but after being stopped too long for my comfort given what was to come, we had to leave before we could get any clean shots of this magnificent peak. Here is one image that sums up my frustration. On our final push towards Yellowstone National Park, we stopped along the way to take in the grandeur of the Tetons. We were a little disappointed with the position of the clouds. As we waited for one cloud to dissipate or move on, another would form and take a position directly in front of the Grand Teton peak. As it turned out, the drive through the northern part of Grand Teton National Park and all the way through Yellowstone was pretty much uneventful. I was, of course, concerned about the road construction north of Norris Junction and what it would mean to the motorhome in mud and hazards. Connie explicitly refused to go over Dunraven Pass. I don’t know why, except that for most of the downhill ride it is her side of the motorhome that looks over the edge. So, whatever the construction zone offered is what we would take. Although it was wet and a little muddy in places, the traffic moved slow enough through the work zone that it was nearly a non-issue. A few dollars in quarters and 30 minutes of my time made the memory fade fast. We spent that first week in the area at Rocky Mountain RV Park overlooking Gardiner and the North Entrance to Yellowstone. We had stayed here several times before and while it isn’t inexpensive it offers a bit of relief following the long drive to get there. We moved into the park and onto Site 1 at Indian Creek Campground on June 6. We would get busy immediately and stay so for the rest of the season. 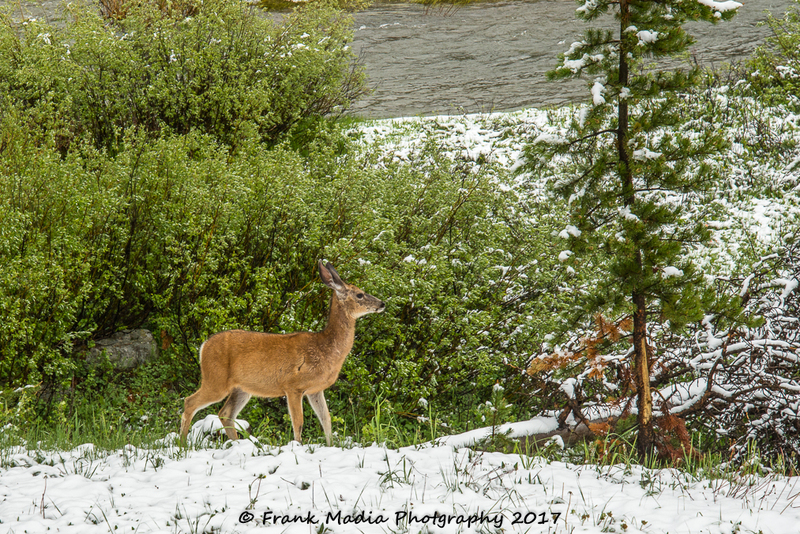 As has been the case for many if not most of the summers we have worked and lived in Yellowstone, this year we had an early June snow that covered the ground at the campground. After the snow stopped, we were treated to a visit. We opened ICCG for the summer 2017 season on June 9. 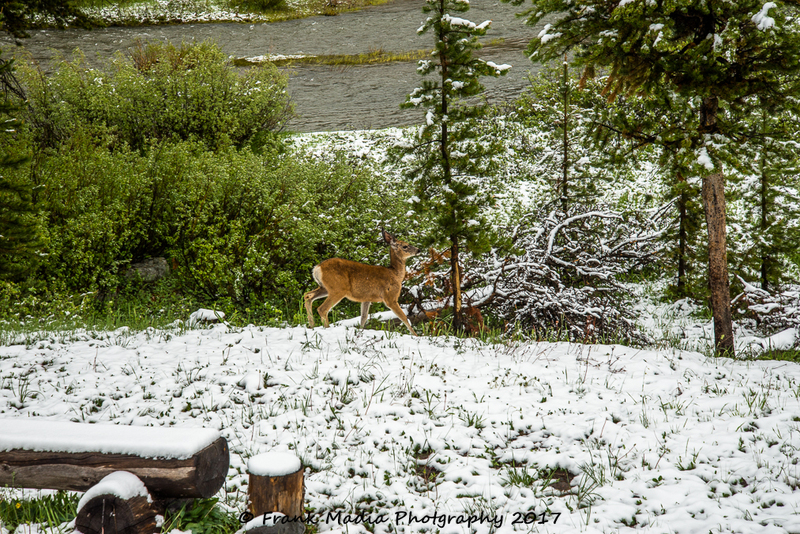 On June 13 we awoke to fresh snow on the ground and deer browsing on the fresh grass just outside our campsite. Other than the fact that it was cold and would stay that way for several days, it was a wonderful sight to behold. This season would see us hosting in one way or other several couples of friends. We also took a few trips out of the park on long weekends. So, we would stay busy and happy for sure. Our first visitors were Scott and Laura Moorehead from Connecticut. The Mooreheads arrived during our first work rotation. However, they had chosen where to stay during their visit well. While I don’t make it a habit of endorsing businesses I have not personally dealt with, I will say that they scored a win with this place. The owner, manager, head cook and dishwasher, was also an avid visitor to the park and is well versed on where to send his guests to make the most of their time. He did quite well by our friends. So much so, that when we completed our work cycle there were few places we could take them they had not only already been. Their lists of must-sees had many more checkmarks than blanks by the time we got together. One of the few places they had not already visited was the Canyon Village area and the surrounding geological wonders of the area. We were more than happy to help them check that location off their list. On June 12 we visited the Brink of the Lower Falls. The day was drop dead gorgeous. The skies were partly cloudy. The water level of the Yellowstone River was high thereby making the water flowing over the falls to look green just before breaking into white foam. We could see all the way to the Lower Falls observation point from far below the falls. I was able to point out a person in a red cap looking up at us from that distant vantage point. The river below the falls was running fast and furious as it made a frothy white ribbon going into the canyon. The canyon walls, in contrast, were glowing yellow with brilliant green grass here and there. The images below are few examples of what we were able to see. Connie and I have visited this place many times before. This visit was possibly the most memorable due to the sensory enjoyment of this spring morning. 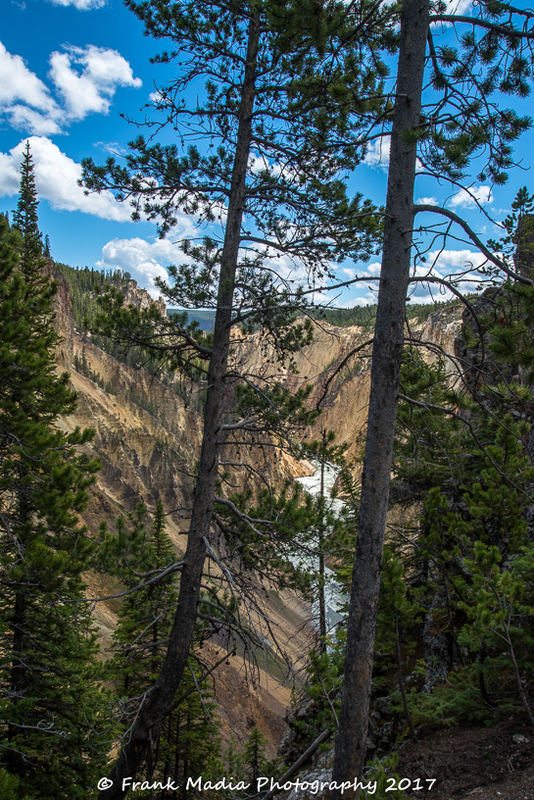 This is one of the views one has to put up with in June in Yellowstone. We were on our way to Canyon Village and I just had to stop and make this photo. I love the greens. A peek through the trees on our walk to the brink overlook. A few yards further down the path. 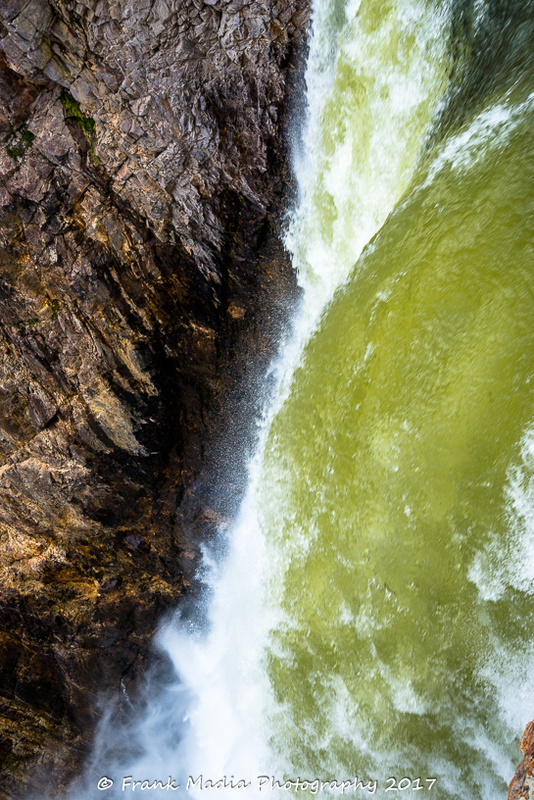 Looking down over the brink of the Lower Falls of the Yellowstone River. These were the teaser images from the falls. My best images can be found on the Portfolio Page of this website. Simply Click Here. 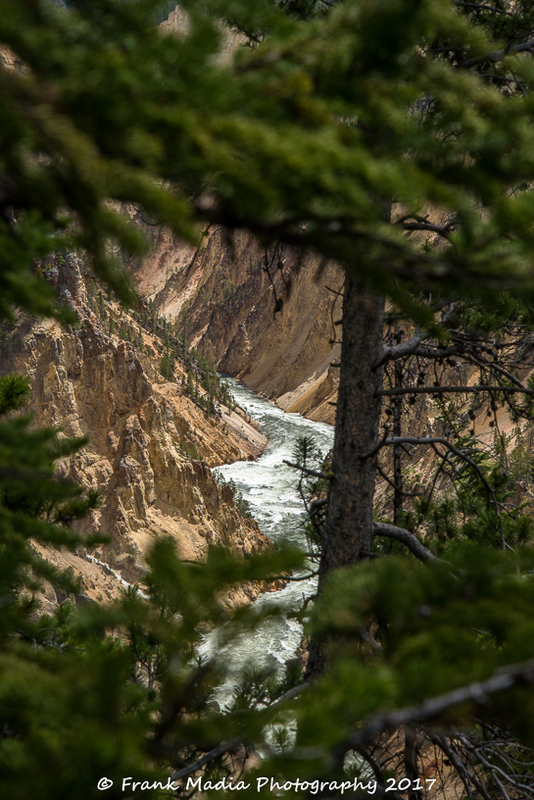 You should find five additional photos from the Brink of Lower Falls of the Yellowstone River. While our visit to the Canyon area was one of the sightseeing highlights we shared with Scott and Laura, the true overall highlight was the many hours we were able to spend with this special couple we had not seen for far too many years. It was a wonderful visit that would be repeated several times with different people as the season rolled along. The next installment will likely get us through most if not all of July and include a visit to the Bighorn Mountains west of Sheridan, WY., with my brother and his family. So, stay tuned. Why are you not 250 lbs with the goodness to golly you eat! I gained two lbs just reading this ! The portion sizes helped a lot, but as the summer went on I didn’t fare so well. When we got home and I went in for my annual visit to the doctor, the nurse said, “You’ve gained some weight haven’t you?” I took that to heart. I have now lost most of what I gained and thinking about adjusting my goal. The menu sounds scrumptious! One thing–at the Falls I remember my first husband hold my youngest out over the falls. I don`t know what possessed him, but I heard her scream in terror and I screamed too. I imagine that he thought to give her a view, she was only a little over a year. He is long dead and she does not remember–but I do–and that reminded me. Yesterday we celebrated her birthday. I so enjoy reading the adventures of Connie and Frank! As usual, Frank, your images are outstanding! Have you broke down and purchased the D850 yet? No, because I have to sell some photos before I can spend more money on new cameras.